VULKAN is the modular, rebound-compensated De-Armer / Disruptor of the 4th generation with many improvements and practical detail solutions. 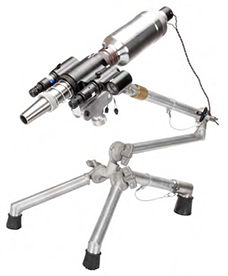 The short distance package has two exchangeable tubes made of stainless steel: a 25.4 mm (1 “) tube for various steel stud and blade projects as well as a 40mm tube with nozzle for water shots with or without a penetrator An electric caliber 50 cartridge, optionally with or without a cable, and a percussion plug for non-electric cartridges is available as an option. Due to the adjustable compensator, only one cartridge type is required for optimum performance. 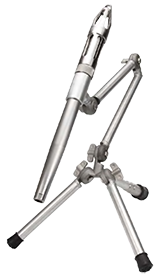 The versatile, lightweight tripod has toothed joints with large wing nuts. The Mamba is a simple lightweight Midi Disrupter with a 140ml/g capacity. 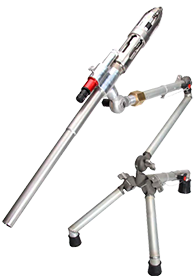 It is designed for both close-up disrupter shots using either water or elastomer and short to medium stand-off shots using frangible and solid projectiles. It is manufactured in high tensile tempered stainless steel. 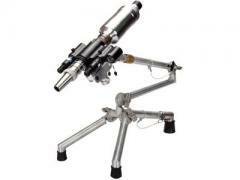 The system features a one piece 20mm smooth bore barrel. The Mamba 20/140 utilises cartridges with a regular 12g magnum case. The cartridges can be leaded electric, leadless electric or percussion according to the type of Breech Plug selected. As standard the system uses lead electric cartridges. The Mamba 20mm Midi R is a totally recoilless Disrupter System which can be deployed to fire water/fluid loads close up in a conventional mode or, a variety of frangible or solid projectiles or regular 12g cartridges with a short to medium stand off from the target IED. The tool can fire a water mass of up to 140ml (5oz) and a range of frangible and solid projectiles. The Mamba Recoilless features a unique Gas Regulator with 3 settings enabling the system to be completely recoilless with different projectile mass for example, 50 or 140ml of fluid, 100g frangible or solid projectiles and regular 12g cartridges. The Mamba Recoilless uses 12g cased cartridges which can be leadless electric, leaded electric or percussion initiated. As standard CSL supplies leadless electric 12g Cartridges. Barrel 20mm, Breech and Shroud Assemblies, Common Breech Plug, Breech Protection/Anchor module. Loading Tool, Red Laser Sight with Beam Steer Zeroing, Mini Allen Balldriver for Laser Sight. Cleaning Rod, Bronze Wire Brush, Lambswool Brush, Lightweight all aluminium Multi Position Stand.